In honor of Heathers, my favorite '80s movie of all time, it's time for a lunchtime poll. 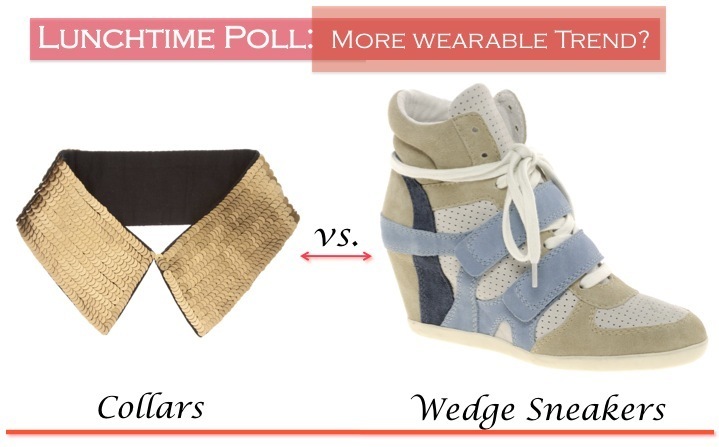 Which trend do you prefer/ think is more wearable; the detachable collar craze or wedge sneakers? Definitely love collars!! Want to follow each other doll? Let me know! collars are great! :) Would you like to enter my ROMWE giveaway? Your blog is fantastic, keep up the good work! I vote for the wedge sneakers! Heathers!! A great one. God, I love the 80's. Hmm...heck I kinda like 'em both! The collar is probably more versatile though, ya know? Dress it up, dress it down - either way it rocks! Love that collar, so fun, feminine and modern. Heathers is the BEST!!! Those wedges are crazy! I can see Lady Gaga wearing those to work out! hah! I would love to see the collar in play! Super fun! collars! i am still skeptical about the wedge sneakers! I really don't know what to say, I'm not a fan of collars or wedge sneakers, but if I have to choose I will say the sneakers. I reckon they're both wearable, but it depends on what your style is. I'd love to wear collars and wedge sneakers (not at the same time)! ..definitely the collar is more wearable , I love them .. I love the collars! I think they dress up any plain shirt. I think you have to have a lot of guts to wear the wedge sneakers! So glad we found your blog:) WE LOVE IT! Love the idea of the wedges but I'd definitely go for the Collar! collars for me..... though, a fab male friend of mine has rocked some great wedge sneakers! Definitely collars, especially if they're Peter Pan collars or have sequins. Its an easy way to dress up a plain tee or tank. Great blog BTW. I like your blog. Thoroughly enjoy the pics! Please stop by my new blog. I follow you. Follow me? Would appreciate it. I am a firm supporter of collar trend! !It gives a masculine sense in any girlie outfit! !So preppy!! Thank you for your comment at my blog!! !hope to see you there again!! wow! This is crazy! I would really like to wear them together .. even if I think it's a little bit TOO MUCH for my style, I love these both things separated! I'm in love with that golden collar!!! Nice blog, I leave you here the mine so then you can check it out and follow if you like!